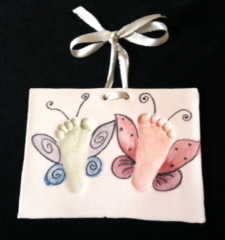 Now available at Terra Mia are soft clay imprints. It's a wonderful way to remember the ever so quick development of your little ones. 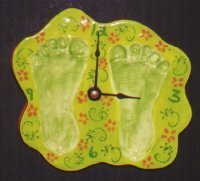 Grandparents and family members go nuts over these beautiful prints of hands & feet - truly perfect gifts for anytime of the year. 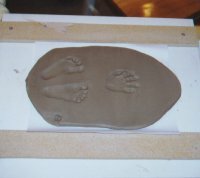 We roll out the clay and the child imprints their hand or feet. We allow the clay to dry a couple of days, and then fire the piece. You'll return to paint the piece with any of our 50 colors! Thanks for all your support with our Food Bank Donation Program. We will continue from January to October - bring in 3 cans of non-perishable food on every Wednesday, and receive free studio time. 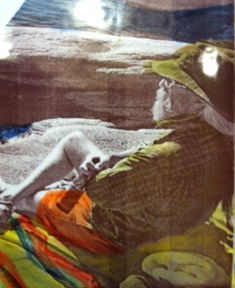 We are pleased to now offer this new photo transfer process at TM. 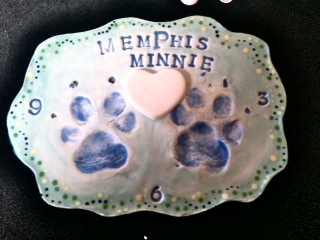 Simply bring in your original photo, wedding invite, logo or artwork and we will fire it onto a finished ceramic piece. It is a two part firing process. First you paint the ceramic item as you wish or just leave it in it's classic shinning white state. Then the second firing is with the decal and once finished it will be food and dishwasher safe. The decal can not be larger than a 5x7 and your original artwork will not be damage. The full process takes several days to complete. The price for each decal is $40 plus the normal studio rates will also apply. The decal comes out in a warm brown sepia color if left on a clean white background but you can paint the background for a wash of color if you choose. Please come into the studio for more information. We are pleased to now offer this new photo transfer process at TM. Simply bring in your original photo, wedding invite, logo or artwork and we will fire it onto a finished ceramic piece. It is a two part firing process. First you paint the ceramic item as you wish or just leave it in it's classic shinning white state. Then the second firing is with the decal and once finished it will be food and dishwasher safe. The decal can not be larger than a 5x7 and your original artwork will not be damage. The full process takes several days to complete. The price for each decal is $40 plus the normal studio rates will also apply. The decal comes out in a warm brown sepia color if left on a clean white background but you can paint the background for a wash of color if you choose. Please come into the studio for more information. We are very excited to now have a private party room for all your party events. It's attached to our garden where an additional three picnic tables are open to your use. Our outdoor heater unit and hanging chinese lanterns add a lovely touch to your special event.